ACCS provides a pre-configured platform (Platform as a Service or PAAS) where you can quickly deploy and host your applications. For many of today’s applications, the hosting server is just that, a place to host the application. Most of the time the only thing an application needs from the server is to have it support the application’s programming language and to provide in and out connections through ports. Using a PAAS such as ACCS frees you from all of the extra work of configuring and maintaining a server and allows you to focus on perfecting your application. ACCS supports multiple languages but for this post, I’ll focus on Python. For the examples, I will be deploying the DinoDate application. DinoDate was written as an open source learning application that can be used to demonstrate database concepts with multiple programming languages. It currently has both Python and NodeJS mid-tier applications and is backed by an Oracle Database. The following instructions show how to deploy the Python version of DinoDate to an Oracle ACCS instance. If you don’t have access to Oracle Cloud services, you can try the Oracle Cloud with $300 of free credit. First, you’ll need a database. Create an Oracle Cloud database or if you already have an Oracle Database, make sure that you can safely create and destroy the DD and DD_NON_EBR schema. The Docker container for Python used by ACCS comes with Python installed. We’ll need to include the rest of the dependencies. Create a deploy directory with a lib subdirectory. Copy the front end client into the deploy directory. Copy the python application into the deploy directory. Change to the deploy directory. Create a shell script, launchPython.sh, to install the dependencies and launch the application. This file declares that we will use Python version 3.6.0 and provides the command that will be used to start the application. This file includes the environment variables DinoDate needs and sets the ACCS deployment to use 1G of memory and only install 1 instance. PYTHONPATH is the directory we will install the Python modules into and LD_LIBRARY_PATH is used by cx_Oracle to locate the Oracle client files. Replace “YourJdbcConnecString” with the JDBC connect string for your database. ACCS is pre-configured to listen on $PORT so we set our application to listen on that port. Do not attempt to change $PORT. When ACCS performs its post-deploy check it will open the application using $PORT, if the application is not listening on that port and returns a 404 the deployment will fail and be removed. Create a zip file with the required DinoDate deploy files. 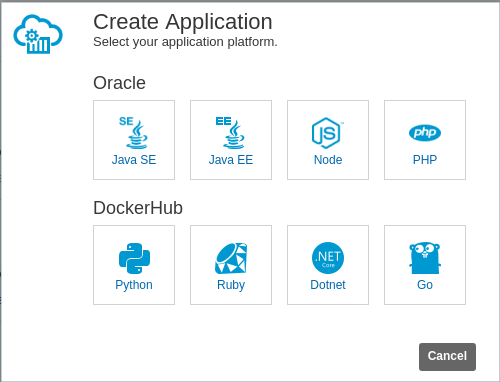 In your browser navigate to the Oracle Application Container Cloud Service Console. 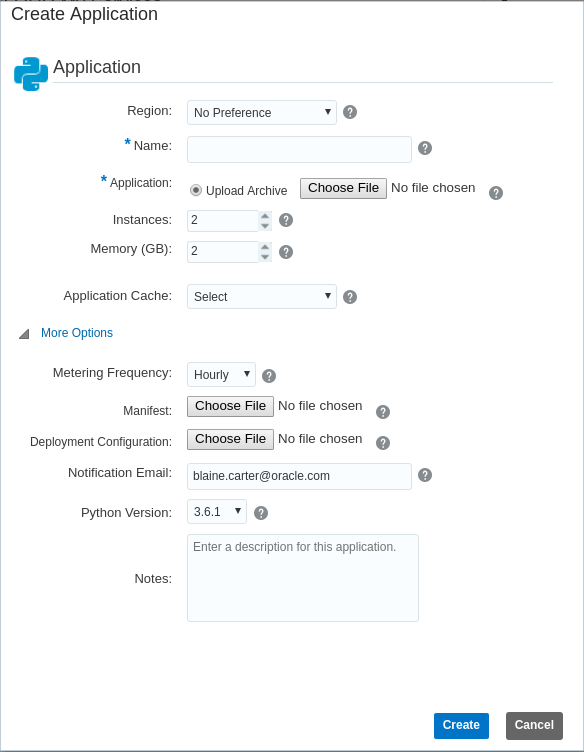 Push the Create Application button to open the platform selection panel. Push the Python button to open the application definition panel and expand the ‘More Options’ section. Click ‘Choose File’ for Archive and select the DinoDatePythonACCS.zip file. Click ‘Choose File’ for Manifest and select the manifest.json file. Click ‘Choose File’ for Deployment Configuration and select the deployment.json file. You can change the values in the other fields as you’d like, but notice that since we defined “memory”: “1G” and “instances”: “1” in the deployment.json file those values will change automatically. It’s also possible to include the manifest.json file in the DinoDatePythonACCS.zip file instead of uploading it separately. It may take several minutes for ACCS to setup the environment and deploy the application. Once it’s done click on the URL: link to open the application. Create a launch script that will install the dependencies and launch the application. Collect the required deployment artifacts and dependencies into a .zip file. Create a manifest.json file that contains at least the required Python version and the command used to start your application. Reminder: ACCS will use the pre-defined environment variable $PORT. Make sure your application listens on $PORT. Use the ACCS service console to upload your 3 files and create your new application.